We Do Austin Attic Insulation Right! Are you tired of paying high energy bills when the temperatures drop in the winter months? Would you like your rooms to stay warmer without requiring as much use of a furnace or heater? If the answer is yes, then call Harco, Inc. We distribute all types of insulation products, which can make a drastic difference in your energy bills. You can save money 365 days a year! Call now for more information. We have successfully served Austin with insulation services for over 10 years. Call us today to start saving! We look forward to serving you. Unnecessary heating and cooling costs are incurred each year by Austin residents as a result of faulty and improper attic insulation. This is costing thousands of Austin property owners a lot of money. Let’s face it, energy costs are only going up. In case you didn’t know, improper roofing ventilation and insulation cause drastic temperature rise by up to 25% or more. The hotter your attic area, the harder it is to keep your home feeling nice. Because of the increase of surrounding temperature inside your home, your air conditioning system is forced to work harder, consuming twice as much energy, to compensate for the excess heat. This in turn can shorten the life of your AC unit. As you know, Austin’s climate can be harsh and subtropical at times, which could take a toll on your home, exposing it to significant amount of heat, causing the home’s exterior to heat up. Humidity is not friendly to homes in Austin. Combined with the heat, well you see where this is going. It can be just plain miserable outside, so why allow that to transfer to the inside of your Austin Home? Sadly, ordinary fiberglass insulation alone isn’t enough to completely stop the heat from moving into your home’s living space. With just a regular fiberglass insulation alone, the heat just isn’t efficiently blocked enough and could cause discomfort during hot summer months. Let’s not forget the Winter. Proper insulation in winter time is equally important. This may not be the East Coast, but you know that winters in Texas can be brutal (at least by our standards). You want to be able to retain as much heat in your home monthly without blowing that money out the window needlessly! An attic offers excellent potential for use of radiant barrier systems: First, because the roof is the surface most exposed to solar radiation, and second, because most of the solar gain absorbed by the roof is transmitted down to the attic floor by radiation. Since the attic airspace separates the hot roof surface from the ceiling, no heat will move down by conduction, and the heat will not convect down from the hot roof to the ceiling because heated air rises. If you place a radiant barrier (layer of foil) in the airspace between the hot roof deck and the cooler attic floor (insulation), you can eliminate almost all radiant heat transfer. 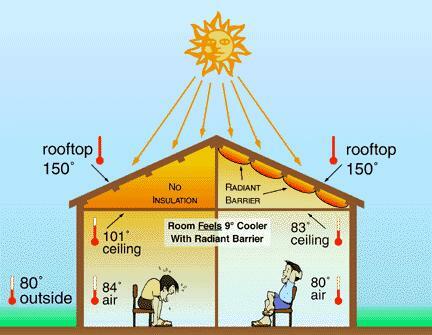 Solar radiation causes roof temperatures to reach 160 o to 190 o F.
Heat is conducted through roofing materials and radiated to the ceiling below. Attic air temperatures climb to superheated levels…typically 140 o F in the summer. Radiant heat transfers into air conditioning ducts increasing energy costs. Attic structure and contents saturate and continue to transfer heat even after the sun has set. A/C run time increases and in peak loads cannot maintain internal temperature set points – comfort is compromised. Air quality is compromised – hot humid air is drawn through leaks in the duct system. Reduces radiant heat transfer up to 97%. Treats the problem at its source: the roof. Significantly reduces attic temperatures up to 30 degrees. Increases insulation and air conditioning duct efficiency. Lowers temperatures and improves comfort in areas that are not typically air conditioned, such as garages and lanais. Qualifies for Texas Energy Code Credits. Energy Star Rating helps to qualify for energy efficient mortgages. Of the three methods, installing a radiant barrier to the bottom of the top cord is the most effective for reducing radiant heat transfer. This installation method yields a 15% to 20% performance improvement. In addition, the top cord installation method reduces material costs especially in hip roof configurations. Radiant barriers are great for bonus rooms and other problem areas for cooling design. Installing radiant barriers in garages, lanais, and gable ends improves overall performance and comfort in building design. Radiant barriers will not harm roofing materials including shingles. 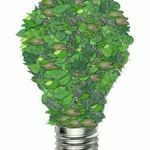 Our society today along with modern technology have come up with some of the best cutting edge green energy solutions for keeping your Austin home insulation efficient to keep costs down and leave a smaller carbon footprint in the world. Who doesn’t love green energy solutions? Radiant barrier insulation and spray foam insulation are now the leaders in the green movement for energy conservation. These solutions actually work and continue to do so for decades after they are installed. This isn’t one of those, “well it kinda does what they claim” situations. You will feel the difference the day it is installed and it will also be reflected on your following months electric bill. Did you know that the City of Austin has now mandated the use of radiant barrier foil to be installed on every new home being constructed? The City of Austin knows from their own research the necessity and powerful performance of radiant barrier foil in a home. If it didn’t perform as well as they have found, they probably wouldn’t have amended the city building code to now include it! 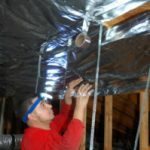 ATX Radiant Barrier & Insulation is the leading Austin insulation company and offers a wide range of home attic insulation solutions for Austin residents including homeowners, property managers, and construction contractors. Whether you need a one time application or wish to partner with us to be your go-to attic insulation company in Austin, ATX Radiant Barrier & Insulation is here for you! Don’t trust your Austin insulation needs to just anyone. Our work speaks for itself and our customers love us because of it! 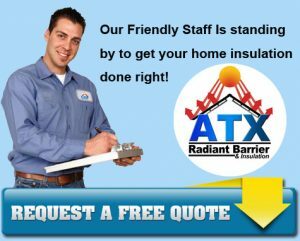 Here at ATX Radiant Barrier & Insulation, we are THE Austin Insulation Professionals. For your peace of mind, ATX Radiant Barrier & Insulation is licensed, bonded and insured. We make a point of following the most stringent of guidelines and procedures for safety for all our roofing and attic insulation projects. With our insulation products and services, you can rest assured that your home is always safe. Put a stop to wasting thousands of dollars each year on unnecessary energy consumption! ATX Radiant Barrier & Insulation provides you with the perfect solution to all your insulation, cooling and heating requirements. Contact us today and learn more about how we can help you lower your energy costs, have a more energy-efficient property and a more comfortable living space in your home. Don’t forget your Austin energy rebates & incentives. For your next project, if you need a dumpster rental try Hook-N- Haul. Did you know that HEB now does curbside delivery?